Best Buy’s recent announcement that it will start charging $25 to recycle each TV and computer monitor indicates that the already stressed U.S. electronics collection infrastructure has gotten worse. We can hardly blame Best Buy or any other collector that stepped up to make recycling easier for consumers. Back in 2004, when not a single retailer was collecting electronics equipment, the Product Stewardship Institute (PSI) teamed with Staples and the U.S. Environmental Protection Agency to start the first computer take-back program in the country. Five years later, motivated by state extended producer responsibility (EPR) laws, Best Buy took Staples’ computer-only program a big step further to collect both computers and TVs, becoming one of the most convenient locations for consumers to return their used electronic equipment nationwide. But times have changed. 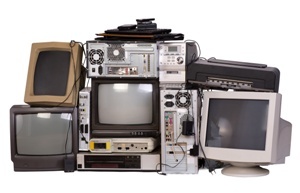 Costs increased, electronics recycling programs became more robust, and vast quantities of higher cost e-scrap are now being collected – changes that have revealed a lack of commitment from most electronics manufacturers to assume responsibility for collecting and recycling used electronics. With its recent announcement, Best Buy stated that it “should not be the sole e-cycling provider in any given area, nor should we assume the entire cost.” To be sure, some manufacturers did voluntarily step up to fill the infrastructure void over the past decade. In 2004, Dell, in partnership with Goodwill, and HP announced free nationwide electronics take-back programs. Samsung and LG followed suit in 2008. Unfortunately, these programs were limited, leaving Best Buy’s program to cover the brunt of the cost. Isn’t it ironic? For the past 15 years, collectively, we successfully educated our citizens about the dangers of mismanaging electronics – about youth using acids to burn off toxic metals in countries without adequate environmental and health protection; about the millions of tons of resources that are buried or burned when not recycled, and which must be mined again, creating double the environmental impact; about the lost recycling jobs that are desperately needed by working families; and about the hundreds of millions of dollars that taxpayers and governments must pay to manage the waste from a multi-billion dollar industry. We all thought we were on the right track, with EPR laws passed in half the U.S. states, some passed with manufacturer support. Resources were conserved, jobs created, and money saved. The public truly caught on – and genuinely appreciated our programs. But those darn markets had to spoil everything. Well-meaning citizens who today know to “do the right thing” are now effectively being told by manufacturers that they don’t really want them to recycle so much after all. The message the manufacturers convey is that recycling is good, but it should slow down. Or someone else needs to pay for it. Recyclers, local governments, and a few retailers are doing their part to collect and divert massive quantities of valuable commodities from disposal. But many manufacturers are no longer willing to cover the costs associated with the proper management of their products at end of life. Recyclers must choose between losing money indefinitely, significantly cutting costs, or going out of business. Local governments, whose residents rely on them for trash and recycling services, are now faced with increased electronics recycling costs – costs they didn’t budget for. Before, government officials directed residents to Best Buy as a convenient alternative to recycle electronics. What will they tell their residents now? Best Buy stands out for its importance in the electronics collection infrastructure in the US. They collect more than any other manufacturer-sponsored program, providing a convenience to consumers unsurpassed by other locations. Even in states with EPR laws, which were intended to hold all brand owners responsible for recycling the electronics they produce, Best Buy has borne more than its fair share of recycling costs, consistently collecting far more material than was required. For example, in 2014, Best Buy recycled more than three times the amount of e-scrap it was obligated to collect in Illinois; more than 4 times its obligation in Wisconsin; and in Minnesota, company officials report that they collect one-quarter to one-third of all electronics recycled in the state – well beyond its market share. One thing is clear – it’s time to revisit the nation’s 25 state e-scrap laws to ensure that all manufacturers are equally responsible for electronics recycling. PSI and our state and local government members understand the complexities and variations in programs nationally, and are working to find fair solutions for all. Since the first electronics recycling law passed in 2004, the dialogue has drifted away from manufacturers taking full responsibility and internalizing the costs of end-of-life materials management. Instead, arguments revolve around how high targets should be, how much manufacturers should pay, and what products they should cover. Past voluntary and legislatively supported commitments made by manufacturers have eroded. They resist attempts to incorporate recycling costs into product price, and instead want to pass these costs on to someone else. Best Buy’s original program is what we need more of in the US – national, no cost, hassle-free product take-back. Their industry colleagues need to match that commitment; Best Buy can no longer be expected to go it alone. To PSI, Best Buy’s move represents a call to action. Let’s work to improve these programs so they support responsible actors like Best Buy, raise expectations of other manufacturers, and meet increasing demand for consumer electronics recycling. Learn more about PSI’s electronics work by visiting our website. Please feel free to contact Waneta Trabert, PSI’s electronics lead, with comments and questions (617-236-4866). Best Buy has been sticking their neck out for much too long only to get slammed when they need to make changes and cut costs. The bottom line is that consumers have to take responsibility for the full lifecycle of the products they choose to consume and that means paying for proper recycling. If a manufacturer makes a difficult to recycle product it will cost more to the consumer, making that product less competitive. Conversely, products with a ‘green’ design will cost less. End-of-life cost should be completely transparent with every purchase we make. I say “Kudos” to BestBuy and “Wake up” to the municipalities and others who have been taking advantage of them. I’d like to offer my apology to Best Buy, if what I wrote seemed negative. That was certainly not my intent. I was actually empathizing with their decision. They provided consumers with the real deal – simple, convenient, hassle-free e-scrap recycling services—and they should be commended for that. I also fully agree with you that consumers need to take responsibility for the products that they purchase. However, many years of research indicate that fees paid at the end-of-life discourage consumers from recycling. It also encourages illegal dumping. Instead of differential fees imposed on consumers at the end of life, as you propose, we believe that consumers should continue to pay in the purchase price. While I am not proposing differential fees up front, the EPR laws in the US right now allow manufacturers to pass on those differential product recycling costs to consumers in the product purchase price. It gives them the flexibility to make that decision. I’d also suggest that other manufacturers have been taking advantage of Best Buy, not municipalities. In many states with laws that require manufacturers to provide free and convenient recycling for their products, Best Buy has been virtually the only one to take that responsibility seriously. If others matched that commitment, municipalities would not be in the position now of having to accept an increased quantity of electronics that are destined to arrive at their facilities. I did not sense you directing negativity toward Best Buy at all Scott, but thanks for the response. It’s not all electronic recycling that costs money. It’s the CRTs (Cathode Ray Tubes) TVs, and Monitors that are the main culprits. Unfortunately CRT recycling costs more in energy and labor than it yields in recyclable material value. On the contrary a Desktop Computer, Printer, VCR, or Cell Phone has enough easy-to-recover metal content that it is profitable, even in today’s depressed scrap market. Because it costs to recycle CRTs, that cost has to be borne by someone. In California and other take back states it’s done by charging fees up front when the item is purchased and then distributing that money in a bounty-type manner to the recyclers. In Oklahoma, (where we operate) there isn’t really any subsidized recycling (my organization accesses Texas take-back money and it’s in danger of being discontinued) other than Best Buy and Goodwill (they dont’ take TVs). So there’s plenty of CRTs out there waiting to be recycled. I also have to wonder about the $25/TV fee. Most R2/E-steward recyclers charge around $0.25/pound. The average weight of TVs I’ve found to be around 40 pounds ($10 in disposal fees). I suspect it’s more about choking back the material flow instead of turning a profit. Charging recycling fees is a barrier to participation. All in all it’s a bad day for electronic recycling and the environment. You are correct that most legitimate recyclers will charge about $.25/pound for CRT products, but that’s just the cost of recycling. It does not include all the handling, storage and shipping costs incurred by Best Buy. $25/unit is probably realistic. This article gives us best and good information regarding computer recycling leed, I work on the project which is based on electronic recycling services. This article also help me in my project.Thank you for this post. You have written a very informative article about Corporate IT recycling with great quality content and well laid out points. I agree with you on many of your views and you’ve got me thinking.